It is more or less agreed upon that Eric Horst is the go-to authority on climbing training. This book is a prime example of how he earned that reputation. 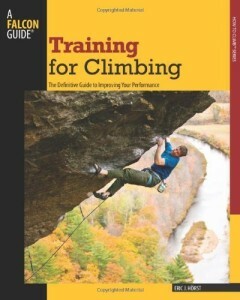 To be clear, this is not a “Climbing 101”-type book. I first picked this book up when I was very new to the sport. I read it, adopted maybe one or two of the key points, and promptly forgot the rest. For beginner climbers, I would instead recommend Horst’s Indoor Climbing book. Only once a climber has mastered the basics of the sport and been lead climbing and/or bouldering for at least a year, then would I recommend this book. The graded nature of climbing inherently urges climbers to try and improve. The complexity and multi-faceted natured of climbing is what makes the sport so interesting, but it also makes it difficult to know exactly how to best train for it. Horst does his best to fix that in this book. There is very little discussion of actual climbing, or “if you climb X grade, train on Y grade.” The book is a lot more focused on what a climber should be doing when they are not climbing, including sport-specific weight training (probably the best takeaway from this book). There is also a big focus on injury avoidance and prevention, nutrition and body mechanics that any dedicated climber should take to heart. I would highly recommend this book for someone who is a beginner or intermediate climber and is putting in the time in the gym and outdoors, but who has hit a plateau after that initial rapid gain in skill. If you’re serious about improving your climbing, I’d check out Horst’s other books too, despite some overlap between the content.